Craig Thompson’s ‘Cartoonigami,’ from the comics section of an older issue of Nickelodeon Magazine. Imagine Mad Magazine's 'Fold-In' concept applied across multiple panels, in both vertical and horizontal directions. Elaborate! While leafing through some sheet music I had bought at an estate sale, I stumbled upon a weird precursor to the thirty-second track preview. On the inside front cover: 6-7 bar ‘previews’ of other sheet music offerings! Now that I’ve seen it, this is the obvious way for sheet music publishers to advertise their other offerings, but it never occurred to me that this was done. Paul Rudd, playing with power. Nintendo of America apparently spotted Mr. Rudd's irresistible charm and goofy likability early, casting him in this Super Nintendo TV spot. Great D.T. Max piece for the New Yorker on Stephen Joyce’s extreme protectionist stance on his Grandfather James Joyce’s literary estate. From 2006 but I just read it (I'm that behind on the pile). I seem to be fascinated by any effort to stave off literary fame (ala Salinger / Pynchon). 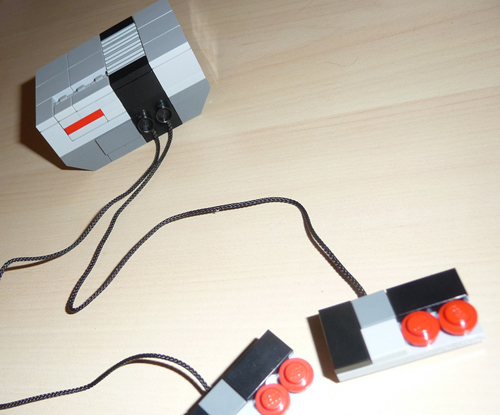 Nerdy, nostalgic Lego model – now as a kit! The model was built by a flickr user who goes by ‘Arkov.’ His photostream is here – there’s lots of other great Lego stuff going on there. I’ve also made it slightly easier for other people to build one. I discovered that if you build a custom model using Lego’s Digital Designer software and upload it for ordering, you can share the link with friends so they can order your model too. All the specifics are below – it’ll cost you about twenty bucks total to build one. I should be clear in saying that none of this money goes to me. You can buy a reasonable approximation of Arkov’s model in kit form here ($14.90). Note that this kit does not come with assembly directions! You’ll have to grab them from the links below. Looks like custom builds expire from the store after about a month. 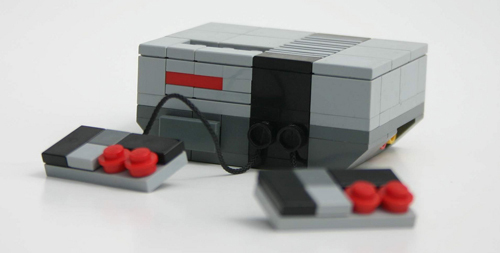 You’ll have to download the NES model below and place the order through the Lego Digital Designer software. Also note: this is not an exact copy of Arkov’s model – but a version adapted to only use parts currently available from Lego. The strings both Arkov and I used to connect the controllers are not currently offered by Lego. You can usually track them down on eBay for a couple bucks. This search should turn up several pair (I used 31L – or 31 stud length strings). You can download Mac or PC versions of the Lego Digital Designer (Which is used to generate nice animated directions) here, and the NES Digital Designer Model here. If you don’t feel like going the fancy route on the directions, you can download a copy of the HTML directions their program spits out here (Not as good!). Also helpful: the instructions Arkov generated for his model are here. If you build one of these, you can (and should!) donate five bucks to the guy who designed this model here. I’ve been in touch with him, and he clearly doesn’t think anyone would ever do such a thing, so help me prove him wrong. I can totally see this “Custom LEGO models available as boxed kits” thing turning into a cottage industry for someone at urban craft shows, etc. I wonder if the 3 per person limit on these kits is some sort of preliminary effort by Lego to avoid that?